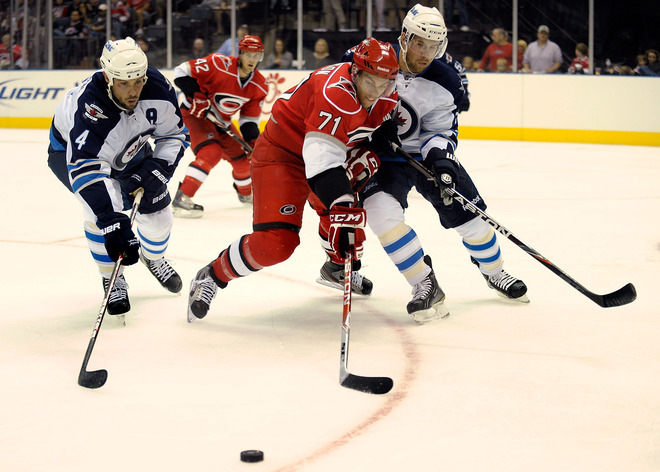 The Winnipeg Jets have slimmed down their roster by another four players Friday afternoon. Forward Carl Klingberg was sent directly to the St. John's Ice Caps, while Brett Festerling (pictured right with Zach Bogosian) and Spencer Machacek were both placed on waivers with the intention of being reassigned to St. John's. If they both pass through waivers they will report to St. John's. The fourth player was David Koci, who was released after the Jets opted to not sign Koci to a contract. Still on the main roster for their game against the Predators are Jason Gregoire, Janne Pesonen, Derek Meech, Paul Postma, Troy Bodie, Kenndal McArdle, and Mark Scheifele. The Jets are expected to make some more cuts before October 9th, with multiple players still battling for limited roster spots.